Do you own or operate a business in South Island? According to current national legislation, you are required to maintain your fire protection equipment. This includes compliance with the relevant safety standards for each piece of equipment. For more information about your specific obligations, contact our fire protection services South Island team today. Did you know that at Jim’s Fire Safety, we provide both electrical and fire safety testing. We have developed a full suite of safety testing services to help you maintain the entirety of your business. Ask us about any number of the following range of services. We believe that the best way to protect your business is with a wholistic approach. Invest in both electrical and fire safety services today and secure your working space. All tests are conducted in accordance with current New Zealand safety standards. After an inspection, you will receive a report containing all of the results. We keep records of all results to help you track your compliance. Our fire protection services South Island team are experienced and professional. One of our most popular services is fire extinguisher testing. 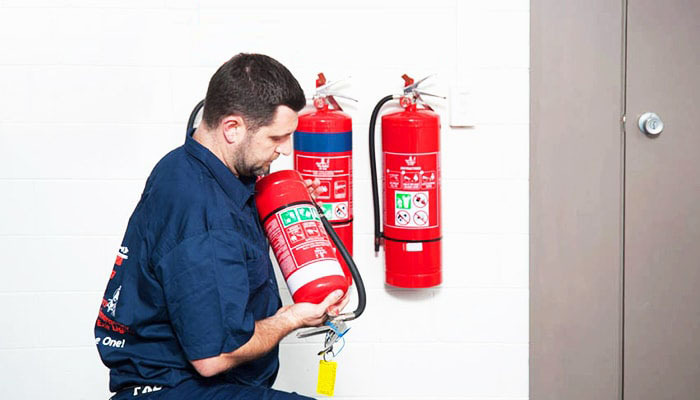 At Jim’s Fire Safety, we test and inspect fire extinguishers according to the the NZS 4503:2005 standard for Hand Operated Fire-Fighting Equipment. This means that all of your portable and wheeled fire extinguishers will need a test at least once every 12 months. In hostile environments, the time frame is 6 months. During a consultation, we can give you your business specific testing periods. There are further requirements for wet chemical and foam type fire extinguishers – they need an extra examination every 3 years for recharging and discharge tests. There are a whole set of other tests that need to be carried out on all types of extinguishers every 5 year interval. For more information on specific tests, have look at our service pages and get in touch with us. After all tests, a service tag must be attached or updated. Now that you’ve read all that our fire protection services South Island team have to offer, get in touch for a free quote. Our professional technicians are highly trained and available right across New Zealand. If you’re located outside the South Island area, don’t fret. Our technicians are completely mobile and can travel to your place of business at a time that suits you. Once you’ve had your first appointment, we have a free reminder service that will help you stay on top of your testing requirements. When your next test date is approaching, we will send you out a reminder so you can book in another inspection. Managing compliance has never been this easy. We also have franchising opportunities available now across New Zealand. So, whatever reason brought you to our site today, if you’ve been considering a career change, why not consider safety inspection? It could bring you the freedom and financial flexibility you’ve been searching for. All you have to do is contact our national team for more information.